If you want to deliver Q-Ride in Queensland you not only need to be qualified, you need to complete the Q-Ride Curriculum Training for Accredited Rider Trainers (ARTs). 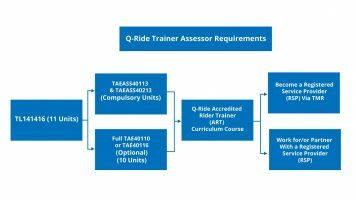 Can I deliver Q-Ride without having completed the Q-ride Accredited Rider Trainer (ART) curriculum course? The course will be delivered by an accredited Q-Ride “Senior Trainer”. What are the Prerequisites for people wishing to do this course? You MUST hold and present these qualifications to the Senior Trainer delivering the course prior to commencement. What do I do once I have completed the Q-ride Accredited Rider Trainer (ART) curriculum course? Once you have completed the ART course a Certificate of Completion will form part of the required qualifications to be presented to TMR. How long does the ART curriculum training go for? What is the start/finish time? How much does the ART curriculum training cost? You may find other Providers offering this program in a shorter time for a cheaper fee, but we have found that 4 days allows to comprehensively cover the material to prepare trainers for the industry. Q-Ride trainers are audited as a routine procedure by Transport Main Road Q-Ride auditors, so as the old saying goes, “Proper Preparation Prevents Poor Performance”. It is our goal to prepare you for a successful transition into the industry and beyond. Our program leaves nothing to chance, takes no short cuts or leaves you short changed in terms of government expectations and industry preparedness. If these dates do not work for you, please let us know what you can do and we’ll try and assist if possible. Do I need my riding gear and a motorcycle for the course? Do I need to bring my lunch and water to the course? What else do I need to being to the course? Please bring your driver’s licence, as well as a biro and paper for note taking. Will I receive any resources on the course?